To try to increase enrollment and revenue, those schools have tried recruiting students from other countries. However, increased competition and federal immigration policy are now making it far more difficult for schools to find students. Early on a Friday morning, teacher Erin Fitts walks to the front of her history classroom at Maine Central Institute (MCI) in Pittsfield, west of Bangor. She introduces the topic of the day: the Cuban Missile Crisis. The students watch a film. Fitts asks them to imagine what it must have been like to live through that tense, historic moment back in 1962. "Think about, in this case, if you just found out there were nuclear missiles near our border, what do you think your response would be?" Fitts asks the students. 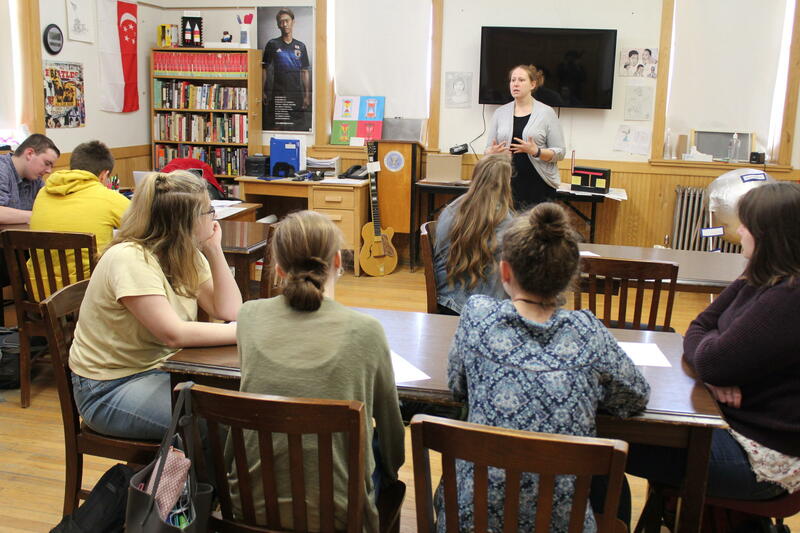 A student from Russia named Ina then moves the conversation in a way you wouldn't necessarily expect in a classroom in rural Maine, where many schools are still overwhelmingly white and full of local residents. Ina tells the class that in her home country, the crisis was seen differently, with most news coming from the government. "Compared to a Soviet person who has not known what was going on during that period," she tells the class. "We call it the Iron Curtain." Discussions like this aren't necessarily unique at MCI. The school has brought in dozens of international students over the past two decades. Fitts says they have transformed her classroom. "It's a really, sort of, neat thing that I didn't have when I was a student here," Fitts says. "To be able to see it and utilize it in my classroom. It's a new challenge. It's a wonderful challenge to be able to see students work like that." The benefits aren't just cultural. Wade Merritt is the president of the Maine International Trade Center, which assists in connecting schools with international students. Merritt says the extra tuition money has helped some private and independent schools keep their doors open in the face of declining enrollment. "As far as being able to bring in different programs, more AP programs," Merritt says. "Bringing in academic competition. Raising the profile and achievement of the domestic students." But after years of growth, the number of international students at Maine's secondary schools has fallen by more than 6 percent over the past two years. That's according to federal data from the Department of Homeland Security. Some schools say they've lost as many as 30 international students, which could mean losing hundreds of thousands of dollars in tuition revenue. "It's more difficult now," says Clint Williams, the director of admissions at MCI. Williams says many reasons have led to the declining enrollment at his school, with the largest being more competition for students. Williams says when MCI began to recruit students from countries like China 20 years ago, it was one of only a few schools in the international market. However, a flood of new institutions have since jumped in, too, with many charging lower tuition: public schools, religious schools, Canadian and Australian schools. Williams says some investors are now even building American-style institutions in China. "I'm seeing hundreds of international schools being built in China as well," he says. "Which keeps the kids in China." There's also the issue of changing immigration policies under a new presidential administration. Abigail Gagnon, the director of admissions at Saco's Thornton Academy, says as soon as President Trump was elected in 2016, she was peppered with questions from prospective parents: would their child be able to get a visa to the United States? Or would it get cancelled? "We have a lot of students from Mexico. And certainly that gets brought up," Gagnon says. "Families have concerns. And none of us know what the future holds here. There's been some talk of reducing student visas. A lot of talk, but nobody knows where it's going to go." Add it all up, and many independent schools now face tough budget questions. Maine Central Institute Headmaster Christopher Hopkins recently sent a letter to parents saying that the school was reducing staff due to declining international numbers. And the University of Southern Maine Vice President Nancy Davis Griffin says plans stopped to build an "international high school" on its Gorham campus last fall. "We were concerned about changes with abilities to get visas and such." Griffin says. "If we would be able to yield international students, and how long they would be with us." A few schools, like Thornton Academy, have been able to push through the recent headwinds and grow, largely by looking towards new countries to recruit. At Lee Academy, Headmaster Gus LeBlanc says his school has embraced new revenue streams. "We can't just depend upon domestic enrollment," LeBlanc says. "We can't just depend on international students coming to our schools. We need to look towards other revenue sources and streams to make sure we're viable." Other revenue sources like international campuses. Right now, Lee Academy is scouting sites to build international schools within countries like Vietnam. It may be a difficult market, but even with declining enrollment, officials say they plan to stay the course and keep recruiting – some even harder, to ensure their schools survive.